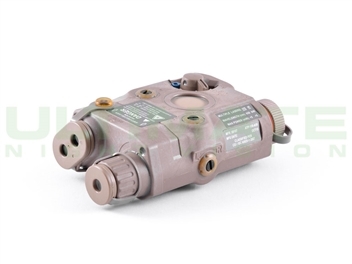 The Advanced Target Pointer/Illuminator/Aiming Laser (ATPIAL) is small, lightweight and easy to use. The aiming system has integrated infrared and visible aiming lasers and an infrared illuminator. The ATPIAL (AN/PEQ-15) has been battle-tested for use on small arms and crew-served weapons. This device is the U.S. Armed Forces standard for night direct-fire aiming and illumination.Some models are restricted for use by law enforcement and military organizations. • Co-aligned visible and infrared lasers. • Hardened for use on small arms and crew served weapons.